Google Docs is an online service provided by the Google. Using Google Docs you can easily manage your spreadsheet, documents, presentation and forms without paying anything. Using Google Docs you can publish documents into your WordPress blog. You can publish your Google Docs document into the WordPress either by using embed code or by copy pasting them into your blog. Before sharing the document you must check the privacy of your document. If your document is in private mode then you can’t share it. So to share the document change it’s privacy mode into public mode. The Process of sharing your document depends on the document type. 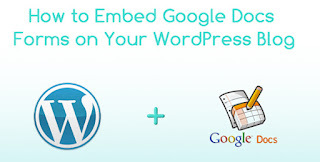 Now I will explain you the process of sharing Google Docs document with the WordPress blog. To publish your spreadsheet into your WordPress blog just open your spreadsheet and click on the “share button “situated on top right corner of your Google Docs page. Then you will get “publish as a web page” option, just click on it. After clicking on “publish as web page” option you will get a window on your screen. You will see drop down list named “sheet to publish”, using this drop down list you can select any number of sheet to be published. If you want to publish the entire sheet then select the “all sheets” option. Just below that drop down list you will get check box if you want that whenever you modify the actual sheet your published sheet reflect those changes then select this checkbox else leave it. Now you will get another drop down list named “get a link to be published data”, just select “html to embed in a page” option if you want the embed code for this Google Docs. After selecting the option in the drop down list you will get a embed code just copy that code and use it in your WordPress blog. I have explained the process of publishing of spread sheet. But to share forms, presentations and other type of document just find the “publish to web option” it will generate an embed code for you, and using this embed code you can use your documents any where in your WordPress blog. To share your Google Docs with the WordPress blog just login on your WordPress account then under this site you will get the “writing” option. After clicking on this option you will get setting and in setting just mark the XML-RPC option. Then go and login in your Gmail Docs account and go to the setting option. In the setting option you have to write your display name and then click on “edit info” link. You will get a popup on your screen. Select the “my Own server/custom “option as Existing blog service. Choose “MetaWeblog API “as your API, enter the URL for the WordPress blog on URL option, give your WordPress Blog’s username and password then blog id and at the end select the “check the Include the documentation title when posting” option and click on “test” button. If your all the setting are correct then it will show a popup with ok message else with an error message. Now you can use your Google Docs on your WordPress blogs. To share any external file just uploads the file and share it using previous methods. Summary: The Google Docs is best service for creating online documents and WordPress is one of the best blogging services. So we can integrate both the services to get high secure and effortless method for our blogs. I am Nadine Myrick from Passcertification Looking for Passcertificaion exam assistance? Let’s take benefit of Passcertification self-paced CCDP Certification training material and clear your IT certification on first try.